Supercars come and go and few make a big impact on the world but the Ferrari F12tdf special edition is something rather different. With heaps of ambition, added power and even more agility, Ferrari’s special edition of the f12 is here with three simple letters to sort the men form the boys; tdf. When it was unveiled in 2016, a new F12tdf cost £339,000 and Ferrari lovers and iconic car fans queued up to buy one. For those who are asking, ‘How many Ferrari F12tdf were made?’ then the answer is just 799. 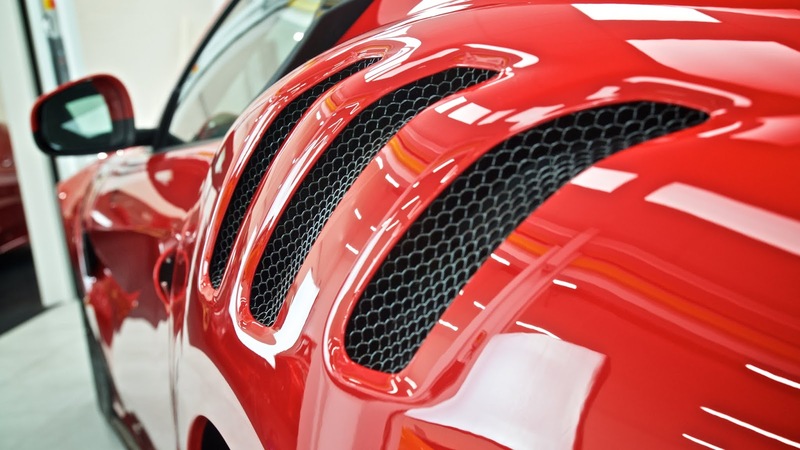 And despite the Ferrari F12 tdf price tag, fans and collectors have seen prices rocket since then and among those who parted with their cash weren’t just exclusive clients but also celebrity petrolheads such as the chef Gordon Ramsay. For the money, buyers got to enjoy one of the fastest Ferraris ever created with a 6.3litre V12 under the bonnet. But how fast is the Ferrari F12? Well, it has a (restricted) top speed of 211 mph. Ferrari lovers said it was the purest of the Ferrari production cars. And they were right. What is tdf in Ferrari? If you are asking, ‘What is tdf in Ferrari?’ then the answer is that this car is a track-focused version of the F12berlinetta which had been unveiled the year previously and pays tribute to the Tour de France car race that was staged between 1899 and 1986. Indeed, the design wizards at Ferrari have given the F12tdf a hint of the stylish GTO's look in its profile. 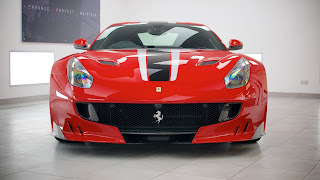 The big attraction for this model is that the F12tdf delivers more power from the same engine used in the F12 berlinetta and offers new technology in a lighter and faster vehicle while promising huge performance levels. How impressive, you may ask? Well, the Ferrari F12 power has seriously impressive torque at 780 PS at 8500rpm and the F12tdf weighs 110kg (or 243lbs) less than its sibling at just 1,415kg - thanks to the extensive use of carbon fibre inside and outside of the car. The power-to-weight ratio for this supercar is 1.95kg (or 4.3lbs) per horsepower. To appreciate how dynamic the car is, 80% of that power is available from 2,500rpm. How have Ferrari added power? Ferrari engineers have revised the inlet tracts and replaced the hydraulic tappets with mechanical ones. Whilst they are a bit noisier they allow for faster, higher revs allowing the mighty V12 to reach an impressive 8900 rpm. These and other modifications have boosted power from a mere 730bhp to a more remarkable 770bhp. Aerodynamics are improved with the bodywork gaining winglets to direct airflow a la formula 1 and the rear track is wider to accommodate the active rear steering. The gear ratios in the 7 speed dual clutch automatic gearbox are shorter which give the tdf a very quick 0-62 mph time of, a not too tardy, 2.9 seconds. As most sports car fans will know, anything under 3 seconds is serious supercar territory. This V12 lump produces 80% of its torque from a low 2000rpm so really pushes you into the seat. This level of power means that to help deal with the rigours of pushing the car to its limits on a track the F12tdf debuted a new four-wheel steering system, known as the Virtual Short Wheelbase, with an 'active' rear axle which enables the rear wheels to pivot and deliver more grip and control on corners. And you'll need it when the engine starts to whine through the gears and Ferrari have also boosted the downforce to cope with the potential of the car taking off with the front bumper design – along with improved wings and louvres. The model is also fitted with three pairs of GT racing strakes, or diffusers, which also boost downforce. There's also a higher and longer rear spoiler helping with a more upright rake and a rear diffuser uses three active flaps to accelerate and increase the airflow underneath the car. For those car fans who love the specs: the special edition Ferrari F12tdf delivers 230kg of downforce at 132mph. That is, Ferrari says, an 87% improvement on the sibling. So, what was the big difference over the standard of F12 in terms of performance? The 6.3litre engine delivers plenty of torque and uses a seven-speed dual clutch gearbox for quicker upshifting and downshifting. The engine will then power the F12tdf onto 124mph in 7.1 seconds and then onto its top speed of 211mph. With all of this power, not all cars fans will get to enjoy the F12tdf's performance but the carmaker appreciates that not everyone has the skills necessary so the front tyres are wider to help increase lateral grip and increase the tendency for oversteering - usually this makes driving at the limit a touch too exciting and difficult for inexperienced drivers. This is where the active rear axle also helps to help deliver agility so non-professional drivers can enjoy the extraordinary performance with some degree of confidence. Though most drivers will be wary on a racetrack once they've let the hammer fall and the F12tdf sets off like a missile. It's this issue of delivering a supercar that non-professional drivers can handle that has been tackled effectively with the Ferrari F12tdf specs: the four-wheel steering system not only delivers responsiveness but ensures that the rear wheels are steering in the same direction as the front ones to boost stability. Ferrari claim that the new wheelbase delivers a better response than the 599 GTO with more predictable precision to suit drivers of various abilities. The handling is also helped by the magnetic dampers being retuned and stiffer springs being added along with the firm's extreme design brake callipers which feature on the LaFerrari. The only place to enjoy the engineering delights is on a racetrack where the throttle can be opened up. Here, the F12tdf delivers great handling and agility with precise steering which delivers excellent feedback. The chassis has been chosen to deliver a responsive drive but with the front end grip being so strong, there is little room for error. This means that inexperienced drivers may find that any slight mistake they make at speed will be magnified by the car until they appreciate the responsiveness and handling more effectively. 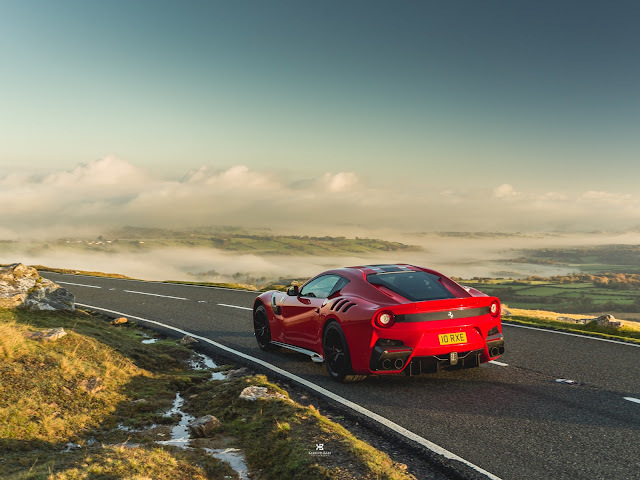 On the roads, the F12tdf has a firm set-up so rough roads will be uncomfortable, but smoother roads help show why Ferrari are so proud of this creation – it’s car that still needs to be respected on the roads and handled as such. There’s definitely a lot of good fun to be had while behind the wheel. The other issue is that once the driver gets to appreciate that there is no chance of oversteering into a slide and that the steering is precise means the car delivers a balanced and smooth ride with the aggressive power being controlled effectively. There’s no doubt the four-wheel steering takes some getting used to but driving at speed into corners can be done with confidence. Even with this level of handling, it's for the engine that the F12tdf offers a stand-out performance and drivers will get to enjoy the raw and impressive levels of power being delivered to the wheels so quickly and responsibly. For a rear-drive machine with a big front engine, drivers get to enjoy a glamorous and aggressive sports car that delivers superlative levels of performance. However, most of the buyers probably don’t push the car to its limits on a racetrack in competition, but if they have made the most of track days then they would have had a thrilling experience. How does that v12 engine sound? Ludicrous acceleration is not all the tdf offers, at the end of the day this is a Ferrari V12 and it sounds glorious. 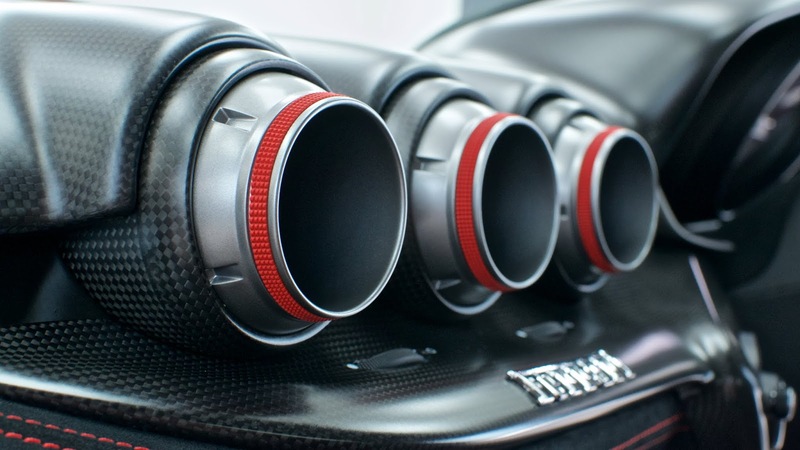 The howl of a Ferrari V12 engine is always going to bring out goose bumps, and is simply one of those definitive sounds that makes everyone turn to look, whether a car fanatic or not. This one also has the sports exhaust to help the engine breathe and aid the increase in horsepower making this F12tdf look and sound like the ultimate Ferrari right down to the red brake callipers visible through the dark wheels. How does the tdf corner? Impressive acceleration is all very well going incredibly fast in a straight line but Ferrari’s have a reputation for being able to go round corners rather quickly as well, and the F12 tdf is no exception. To give it faster entry and exit corner speed Ferrari bolted on bigger 285 section front tyres. Now that the front could get in and out of a corner quickly the trick was to get the rear to follow. Ferrari fitted an Active Rear Steering unit which turns the rear wheels, in most cases, in the same direction as the fronts. To say it turns the wheels is slightly misleading; it changes the toe angle by approximately one degree. What this means is that the rear now follows the front with a greater degree of stability and agility. Add to this the fact that the spring rates are 20% stiffer giving a firm but by no means uncomfortable ride - and you approach a corner with the confidence that you will still be on the black stuff when you start feeding in the power as you come out the other side. The steering is two turns lock to lock and gives a race car type feel as less input is needed to sweep through bends. For a great car like this the fuel figures are irrelevant but it returns 15 l per 100km which is a reasonable (for the power and performance) 18mpg and emissions are 360g/km. This probably explains why this track-focused creation isn't really for the public roads. To underline this performance, the F12tdf went around Ferrari's testing facility at Fiorano quicker than the Enzo in just 1 minute 21 seconds. It helps too - and brings confidence to the person sat behind the steering wheel - that there are big brakes fitted to the car which will bring the vehicle to a stop within 30 metres when travelling at 62mph. For those lucky enough to sit inside one, the Ferrari f12 interior features a racing cockpit that is well-designed and means business! It's a comfortable place to enjoy the delights of the F12tdf and there are knee pads where the glovebox should be and the seats use a technical fabric and the floor mats are patterned aluminium. And if you fancy picking up a Ferrari F12tdf for sale, then you'll need a big wallet to do so. That's because earlier this year a limited edition Ferrari F12tdf was put up for auction for a cool £1 million – that’s an appreciation of three times what it was worth when bought new two years previously. Though the car was withdrawn from sale, interest might have been helped by the fact there were only 150 miles on the clock - so that really is one careful previous owner! Part of the reason for the soaring price of the F12tdf is down to its rarity, but there is no escaping the fact that this limited edition really is a fabulous creation paying tribute to the iconic Ferraris of the 1950s and 1960s. Essentially, the Ferrari F12tdf might be a tribute act to the iconic motors of that generation but it's one of the true all-time modern great front engine supercars and deserves all of the plaudits it gets. A word of caution- this is not a car that you just jump into and go quickly (unless your name is Sebastian Vettel). It is a special edition Ferrari and as such has to be treated with respect. However, once you have learned all the race car inspired quirks, it is a feat of engineering that will put a huge smile on your face. With its vast amounts of grunt and impressive cornering grip, the rear end of the F12 tdf is the view most other drivers will see. Having said that the rear end of the tdf is rather pleasing on the eye. Great review again supercar guru! it's been quite a long time but hey the content is always on point. Is this a limited production ferrari? Which one will you go for and why? Ferrari F12 TDF or Mercedes SLS AMG Black Series? In any case, what made the quattros setup so unique was that it likewise transmitted power forward, utilizing an empty gearbox yield shaft, to a comparable differential that drove the front wheels!